Albion is right next to the suburb of Sunshine, and was developed by H.V. McKay as part of his Sunshine Estate. His own house was in Albion, showing that he was not too proud to live alongside his workers. Albion is the oldest known name for the island of Great Britain. The meaning, which comes from Ancient Celtic, may either mean “white”, perhaps referring to the white cliffs of the southern shores, or “hill”. According to K.M. Sheard, it should be interpreted as “white upper world”, to distinguish it from the dark Underworld (and thus similar to the Midgard of Norse mythology, which became the Middle Earth of Tolkien’s fantasy world). It’s related to a Welsh word which simply means “earth, world”. The Ancient Greeks and Romans knew of Albion, and even in their time, it was considered a name of great antiquity. Today Albion is often used as a poetic term for Britain, such as in our national anthem – “when gallant Cook from Albion sail’d”. In British mythology, Albion was a giant who ruled Britain and gave his name to the island. It’s an imposing heritage choice, very suitable for a baby born in a Jubilee year. Baxter is a rural locality on the Mornington Peninsula, and received its name because it was founded by pastoralist Benjamin Baxter, who came here as a member of the 50th Regiment. The property he owned, and the cottage he and his wife Martha lived in, are both still in existence today. The township developed in the late 19th century once the railway arrived. Baxter is an occupational surname from the English word bakester, originally referring to a female baker, as opposed to the male baker, but very soon accepted as meaning both men and women, and then as masculine only. The surname is most common in Scotland, and the northern counties of England, especially Yorkshire. There are several famous Australians with the surname Baxter, including the explorer John Baxter, who was killed on the expedition across the Nullarbor Plain. With its fashionable X and nickname Bax fitting in with Max and Jax, this now seems a pretty cool option as a boy’s name. This was chosen as a celebrity baby name last year by radio host Kate Dimond. Brighton is a beachside suburb named after the English seaside town. Brighton is from the Old English, meaning “Beorhthelm’s farmstead” (Beorhthelm is a man’s name meaning “bright helmet”). The suburb was bought by an Englishman named Henry Dendy in 1840, who got it for 1 pound an acre, sight unseen. He chose the name Brighton, hoping this would also become a fashionable seaside resort. Unfortunately, there was a depression at the time and Dendy was forced to sell the land to his agent. Dendy died a pauper, but his dream did come true, because very soon Brighton began attracting wealthy residents, and it remains a very exclusive address, full of luxury mansions. 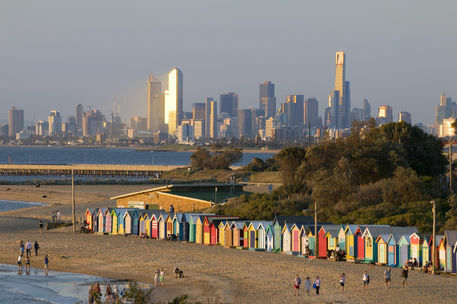 One of its most notable sights is the 82 colourful bathing boxes, which have been on Dendy Street Beach since the 19th century. These can only be owned by rate-paying residents, and will set you back at least a couple of hundred thousand dollars. Brighton is the home of many of the rich and famous, including former athlete Catherine Freeman. I’ve been seeing this bright, right-on name quite a bit lately in birth announcements for boys, and the suburb does give it a swanky air. Elwood did not have the most glamorous beginning. A piece of swampland, the first settlers came here because of fever. It was Victoria’s first quarantine station, and the area’s first cemetery. Elwood became a working class suburb with such lovely features as an abattoir, a very smelly canal, and, before sewage, a dumping ground for human waste. However, today the Art Deco houses, pleasant beach, leafy streets, and busy cafe strip make it a very upmarket suburb. It’s thought to have been named after the Quaker poet Thomas Ellwood, because Governor La Trobe, who named it, had a thing for Quakers. The surname can be after Ellwood in Gloucestershire, which means “elder wood”, or derived from the Anglo-Saxon man’s name Aelfweald, meaning “elf ruler”. As elder trees play a big part in folklore, and The Harry Potter books feature the Elder Wand, it’s a very magical sort of name. I saw this at Mer de Noms and in a birth announcement, then it was covered by Upswing Baby Names, and then at Appellation Mountain. Perhaps because of the Blues Brothers, this name is seemingly now very hip. Please do not match it with a brother named Joliet or Jake though. Fingal is a rural suburb that may be named after the Irish county of Fingal; the county’s name means “foreign territory”, because the Vikings settled in the area. However, Fingal is also the Anglicised form of the Gaelic name Fionnghall, meaning “white stranger”. This also refers to the blonde Viking settlers, and Fingal mac Gofraid, a ruler in the Scottish Hebrides, was part of this same Norse dynasty. The name has a distinct literary air, as Fingal is the hero of James McPherson’s epic poem Fingal, and Irish author Oscar Wilde had Fingal as one of his middle names (Oscar is another name from McPherson’s poetry). McPherson claimed to have based Fingal on the legends of Irish folk hero, Fionn mac Cumhaill – Fionn’s name simply means “white”, and was a nickname; his real name was Deimne (meaning “sureness, certainty”). Fingal’s Cave in the Hebrides is named for the epic hero, and the sea echoes there so melodiously that it inspired a piece by composer Felix Mendelssohn. Irish names starting with Fin- are very fashionable right now, but I haven’t really seen Fingal in use. It seems poetic, musical, and quite fairytale to me. Gilderoy is a rural locality in the outer suburbs; it’s a rare variant of the Irish surname Gilroy, an Anglication of two possible Gaelic names which either mean “son of the red haired servant” or “son of the king’s servant”. As a first name, Gilderoy was used by British Gypsies, and a man who rejoiced in the name Gilderoy Scamp was King of the Kentish Gypsies in the late nineteenth and early twentieth centuries. Of course, this name will remind many of Gilderoy Lockhart, the vain and boastful fraud from the Harry Potter books. J.K. Rowling apparently named him after the handsome Scottish highwayman, Patrick Macgregor, whose nickname was Gilderoy (from the Gaelic Gillie Roy – “red-haired lad”). Both Lockhart and Macgregor had reputations for winning women’s hearts undeservedly, and one of Macgregor’s smitten female fans is supposed to have written the song Gilderoy about him. Perhaps Rowling was also thinking the name sounds like the English word gild, meaning to give a thin veneer of gold (to cheaper materials). I don’t know if anyone will actually use this name, but it’s a pretty fabulous one, with some very colourful namesakes. Harkaway was settled by German immigrants, and is now an attractive suburb with large distinguished houses and extensive parkland. I first saw this name given to a minor character in Stella Gibbons’ hilarious novel, Cold Comfort Farm, and found it fascinating. Another famous literary Harkaway was Jack Harkway, from the Victorian era “penny dreadfuls” – a schoolboy who ran away to sea and had a life of adventure. There is also the novelist Nick Harkaway, although it’s a pseudonym; he’s a son of writer John Le Carre, and his real name is Nicholas Cornwell. Hark away! is a cry traditionally used in hunting to encourage the hounds; to hark means “to hear, heed, listen”. It’s a genuine, although rare, surname, and I presume an occupational one to denote someone who worked with fox hounds. I have seen this used as a man’s name in old records from the United States; I’ve only seen it used as a middle name in Australia. This is a really unusual vocabulary name which, with its meaning of “to listen”, almost qualifies as a virtue name as well. It isn’t much like any name on the Top 100, but it continues to fascinate me. Ivanhoe is a suburb with many old homes and an Art Deco town hall, famous for the extravagant Christmas lights display it puts on each year. It was named by a Scottish settler after Sir Walter Scott’s 1819 novel, Ivanhoe. The book is a romance about one of the few remaining Saxon noble families at a time when the English nobility were almost all Norman. The protagonist is the Saxon Wilfred of Ivanhoe, who has sworn allegiance to King Richard I, and amongst the many characters are Robin Hood and his merry men. The novel is credited for starting the medieval revival of the 19th century – hence the number of Victorian babies named Alfred or Edith. Although the book is set in Yorkshire and Nottinghamshire, the English village of Ivinghoe is in Buckinghamshire. The village’s name is Anglo-Saxon, and means “Ifa’s hill spur”. The Anglo-Saxon Ifa later merged with the Norman Ivo, both names meaning “yew bow”. It’s dashing and looks like Ivan with a fashionable OH sound, but will the -hoe at the end prove problematic? If you are stuck for sibling ideas, Elea at British Baby Names has many suggestions! Skye is named after the Isle of Skye in Scotland, the largest island in the Inner Hebrides. It was at one time ruled by Vikings, and even the Gaelic clans who were chieftains here have Norse ancestry. The island’s name is an etymological tangle of several languages. However, the Norse referred to it as skuyö – “the isle of cloud” – and this looks a lot like the English name for the island. The ruggedly beautiful Isle of Skye has spectacular Highland scenery and abounds in wildlife such as red deer and golden eagles; a popular tourist destination, it was recently voted the fourth best island in the world. It is known for its castles, including Dunvegan, which has an ancient flag supposedly gifted by the fairies, and is the oldest Scottish castle continuously occupied by a single family (since the 13th century). The island features in the lovely Skye Boat Song, which tells of the Jacobite heroine Flora McDonald helping Bonnie Prince Charlie escape “over the sea to Skye”, after the defeat of the Jacobite rising. This attractive unisex name is more often given to girls, but to me it seems equally suitable for boys. Yannathan is a rural area in the Shire of Cardinia, and its name, from a local Aboriginal language, is translated as “to walk about, wander, travel, journey, roam”. Walkabout is a term from Indigenous culture which is understood to mean a journey undertaken as a rite of passage; a deeply meaningful spiritual quest which involves connecting with the traditional land and understanding cultural obligations. Australians of British descent also use the term loosely and colloquially to mean anything from going on holiday to escaping your customary obligations to disappearing without apparent cause (as in “the scissors seem to have gone walkabout”). I am not sure if yannathan was meant in any other way than just to take a walk or go on a journey, but it’s a word which may resonate with many Australians. Pronounced YAN-a-thun, it sounds like a variant of Jonathan, and seems very usable. It’s yet another name you could get the popular nickname Nate from.